Place the tomatoes into a bowl and drizzle with the olive oil. Add the thyme and season well with salt and freshly ground black pepper. Place the ricotta, goats' cheese and parmesan into a clean bowl and mix well. Add the spinach and garlic and season well with salt and freshly ground black pepper. Lay the pasta sheets onto a clean work surface. Place a line of the cheese and spinach mixture along the longer edge of each pasta sheet, then roll up like a cigar. Drizzle the cannelloni rolls with a little of the oil that the tomatoes have been sitting in, then pour the remaining oil into the bottom of an ovenproof dish that will hold all 12 cannelloni. Place the cannelloni tubes into the dish and place the tomatoes evenly over the top. Transfer to the oven to bake for 15 minutes, or until cooked through. 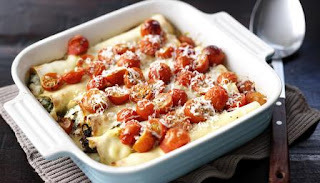 To serve, place three cannelloni onto each of four plates. Sprinkle with parmesan shavings and place a spoonful of dressed mixed green salad leaves alongside. Newer PostDo not let anyone label you. Older PostLove vs Fear? Which one would you pick?